September water temps were slightly above normal. Surf had a low of 79°, high of 84° with an average of 82.0°. Sound had a low of 75° and high of 86° and an average of 82.8°. 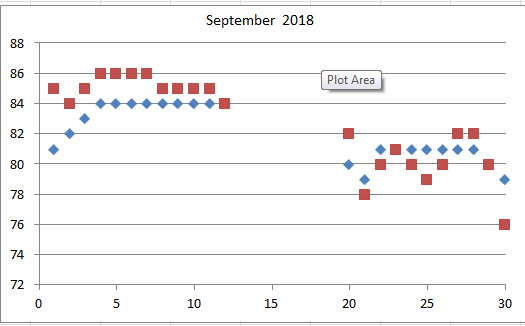 The data is probably a little off since I missed a week’s data due to Florence. AS expected after the hurricane the ocean temps dropped due to mixing. Check out the graph, blue diamonds are the surf, red squares are the sound temperatures.